Elk Grove was once a stage stop for weary travelers, but there’s no rest for residents planning a move within the area. That is, unless you hire Mid Cal Moving & Storage! As the premier Elk Grove moving company, we offer a wide selection of comprehensive solutions that allow our customers to sit back, relax, and enjoy a seamless relocation experience. Mid Cal Moving is proud to be a BBB-accredited business with ProMover status from the American Moving & Storage Association. These designations show that we hold ourselves to a high standard of service that remains unmatched by other moving companies in Elk Grove. In addition to these industry affiliations, we are also a proud agent for Bekins Van Lines, lending us resources and support to provide efficient relocations to over 100 countries. 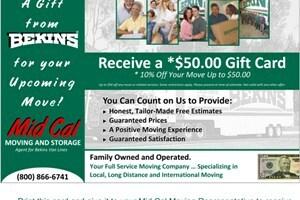 Choose Mid Cal Moving for your next move and rest easy knowing that your relocation is in the right hands. Make your relocation a breeze by hiring the top-rated movers in Elk Grove! Give us a call to learn more about the services we offer or fill out our online form to schedule your free, in-home estimate today!